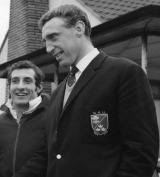 Price is a former Welsh international who won 32 caps for his country between 1961 and 1969 and also toured with the British Isles to Australia and New Zealand in 1966 - earning four caps. Price came to the notice of the Welsh selectors after cutting an impressive figure in the second-row for the Barbarians against the much-vaunted Springbok pack in 1961. He was subsequently fast-tracked him into the Welsh side a month later for their match against Ireland. He went on to become a mainstay of the Welsh scrum until 1969.